Oil and gas production platforms deal with inflammable materials 24/7, so fire prevention rules are strict. Even so, fires do break out, and you need some way of dealing with them fast. Semco Maritime’s rapid response firefighting systems make sure an outbreak is extinguished before any serious damage can be done and before anyone gets hurt. Every platform is unique. That’s why our firefighting systems are easily integrated into the specific structure and layout of your platform, covering all potential hotspots without overreaching your budget. Our engineers have developed firefighting systems that satisfy the highest demands for reliability, operational safety and life-long technical support. 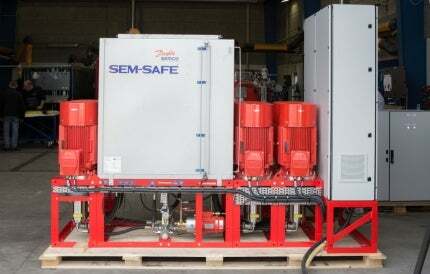 Using a dense mist of water, SemSafe extinguishes fire without the need for harmful chemicals and it’s unique to Semco Maritime. Because there’s no CO² or halon, there’s no need to wait for people to get out of range of the poisonous gas, and there are no harmful environmental after-effects. You save on water: the mist is extremely fine, so it doesn’t take large volumes of water to extinguish a fire. You save on space: a CO² system with the same capacity as an 8m² SemSafe system requires 50m² to 60m². And you save on downtime: a one-shot chemical extinguisher doesn’t reduce the heat of the fire, so it can take 48 hours before crew members can go in and clean up. With SemSafe, your people can be back in minutes. While our water firefighting systems will put you in control of any fire on your platform, foam is the only proven firefighting system against fire on heli-decks. All our systems are tried and tested by our in-house experts, and certified according to internationally recognised standards. Our highly skilled service technicians and engineers can help your business at very short notice, worldwide.